Natural And Powerful Enzymes For A Healthy Digestive System! Nattokinase is an enzyme isolated from "Natto," a traditional Japanese fermented soy food. Natto has been consumed safely for thousands of years for its numerous health benefits. * More recently, both clinical and non-clinical studies have suggested that Nattokinase may support heart health and promote healthy circulation. 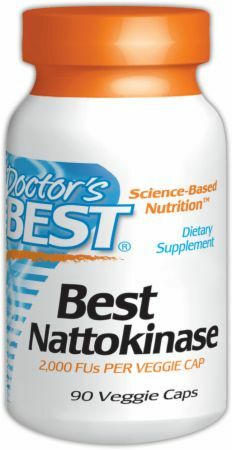 * Each serving of Doctors Best Nattokinase provides 2000 FU (Fibrinolytic Units). No Best Nattokinase Reviews Found. 90 Vcaps - Special Pricing! Directions For Best Nattokinase: Take 1-2 capsules daily, between meals. Warnings: Do not use this product if you are pregnant or nursing, are allergic to soy or lactose, or if you have a blood coagulation disorder. If you are taking an anticoagulant (blood-thinning medication) or vitamin K, consult a physician before taking this product.